Annan Castle is a partially surviving earthwork castle erected by the Bruce Lords of Annandale in the 12th century. The repeated flooding of the River Annan has eroded the western side of the motte and the bailey, leaving it strangely deformed. Around the perimeter are the remains of the ditch which surrounded the whole castle, which is open as a public park and has parking by the riverside. 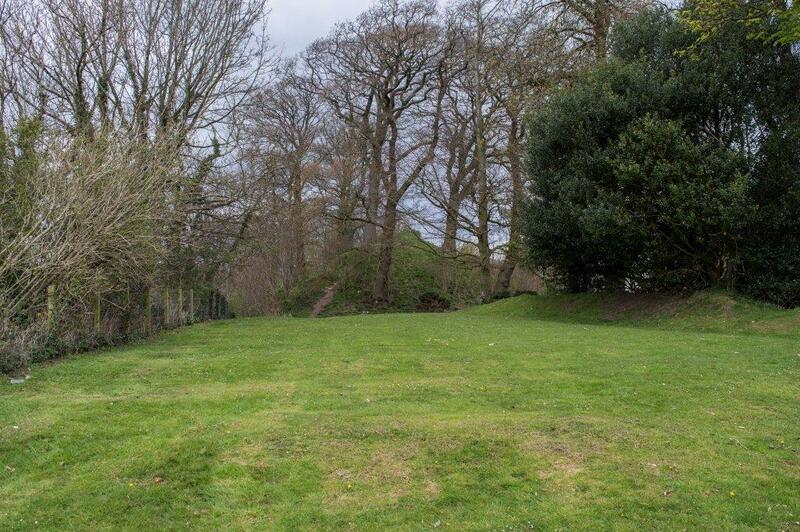 The castle appears to have been of a very traditional motte and bailey design, although the erosion has left the motte with little more than a ridge remaining of the summit, which was originally over 15 metres high and about the same size across. The bailey measures perhaps 90 metres long, but the original width is unknown. Strategically placed to guard the crossing of the river from Galloway, it harks back to a time when Galloway was not considered part of the Kingdom of Scotland but was ruled by an independent dynasty of princes. It also guarded an important route northwards from Cumbria towards Lothian and Strathclyde, and Annandale was one of a number of Lordships created in the 12th century by David I when he became King of Scots for magnates he had an established relationship with through his rule of Cumberland and Northumberland under Henry I of England. Bruce had previously held land in North Yorkshire, and may have installed his son in Annandale. Certainly at the Battle of the Standard in 1138, father and son fought on opposite sides, the son for David. Although the castle remained strategically important, the Bruces had another earthwork castle at Lochmaben a short distance to the north. It is usually believed that Annan Castle was abandoned in favour of Lochmaben, but it is by no means impossible that both remained in use for some time. During the reign of David’s grandson William, a rebellion in Galloway appears the most likely reason for the destruction of Annan Castle, at which point the seat of the Lordship moved to Lochmaben and the old castle appears not to have been reoccupied. Another theory relates to an outbreak of plague at Annan at the end of the 12th century. All that can be said with certainty is that Annan Castle was abandoned within a few decades of having been founded, and left to obscurity and the tender mercies of the river.